If you’re a cyclist in the Bay Area and you haven’t finished all of your holiday shopping, I’m here to help. If you aren’t a cyclist in the Bay Area and you haven’t finished all of your holiday shopping…what’s wrong with you? Go buy a nice bicycle for yourself that you can ride safely. Then come back to DIYBIKING.COM. Then I can help. Since I don’t have a lot of time until Christmas Day I want to head straight to the summit of the Difficult People to Shop For List: the cyclist who has everything. As it happens, that category has a place of overlap with the polar opposite: a cyclist who has nothing but is home from college visiting his or her parents for Christmas break. It is for these two groups (and more) that are perfect recipients for Park Tool School, which is an 18 hour education program taking place at Good Karma Bikes beginning on January 12 and ending on January 21. The full schedule can be found here. This gift of wrench smarts is $250 and includes a copy of Park Tool’s Big Blue Book of cycling repairs, a 20% off discount of GKB’s retail items during the month of the session, and a Good Karma Bikes T-Shirt. So if you’re giving a gift that falls in that Venn Diagram zone between the person who has everything and the college student who has nothing - look to Park Tool School at Good Karma Bikes - their retail shop is open today and tomorrow between 2:00pm and 6:00pm if you need other gifts as well. 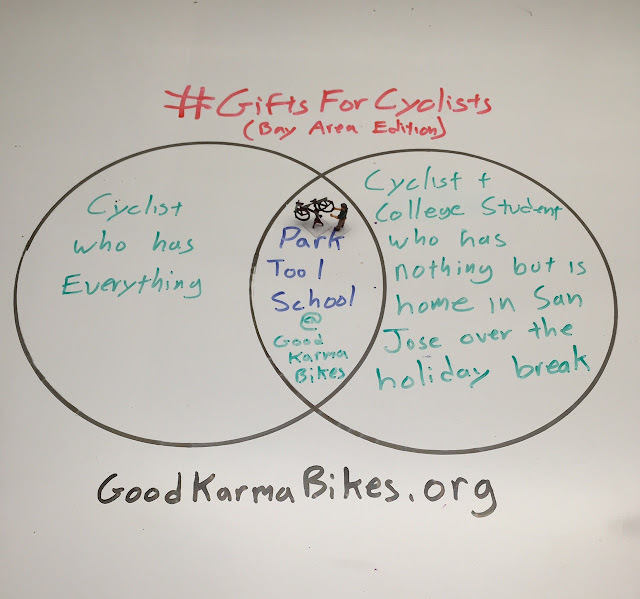 And if you want to exchange gift ideas on Twitter or Instagram, use the hashtag #GiftsForCyclists. Thanks for reading and thanks for riding.